As soon as I became of age to join, I took a bus to Louisville to join the Army Air Corps, as it was called back then, but the day I arrived the office was closed. As I stood there in the front of the office deciding my next move, some Navy recruiters tried their best to get me to join the Navy, but I told them no thanks and that I had my heart set on enlisting in the Air Force and only the Air Force. My next step was to go down to Nashville, which I did during the last week of June 1942 and was able to enlist into the Air Force but being so close to the fourth of July, I was told to go home and return after the fourth. On the fifth, I showed back up and was sent for my basic training to Camp Forrest, Tennessee before being sent to my first school in Biloxi, Mississippi. By September of that same year, I had finished and was on my way to Santa Ana, California for my pre-flight school. Following the next two schools I was endeared to Wesley Huckins, who would be my pilot. West, as I called him, was a guy from the Midwest and had named our plane by the time I had arrived. He named our B-17 “The Squirming Squaw.” Our group of B-17s was to be the last group to fly over the north Atlantic route due to the weather. Our last stop before flying on over was Gander, Newfoundland where we spent the night. The following day during takeoff, one of the planes crashed into the side of the mountain, killing the crew. The eight-hour flight over the Atlantic was rough due to the weather and our navigator had a hard time keeping us on course. We had also run into a lot of icy conditions, which caused ice to build up on our wings.During the last hours of our flight, we thought we were off course and had gotten lost so it was decided to drop below the clouds only to find out we were over Ireland. We landed at Rattlesden Base, England and it was from there that we would fight our missions from and call home. The base had been an old RAF base and the women who were in the RAF had used the building we were assigned to sleep in. The building was constructed of concrete and I remember having to put my raingear over my bed to keep me dry. Water from the ceiling would drip onto the beds. Each room housed four officers made up from two different planes. Our two roommates, along with their crew, were killed later on during a takeoff. All of our crews were assigned to these metal huts on the base. When we first got to the base, the base’s crew hadn’t arrived so the plane’s crew had to do KP duty until the base’s crews had gotten there. After we were settled in and they weren’t on KP duty, we would spend as much time as we could removing the paint from the outside of our plane. Doing this, we hoped to get a little faster air speed out of the plane. It wasn’t until after we had flown some missions that we learned the German fighters went after the shiny planes first so it wasn’t long before we had to change, so we flew the plane to a base in Northern Ireland where they repainted it. Also, when we first arrived our first wing commander was none other than Curtis Lemay. After we had flown a number of practice flights over England, we prepared to make our first mission. The days started at different times due to the targets. Some missions called for us to be woken earlier than others. CQ would send a guy around to wake us between three and four in the morning for the mission. You would get up and dress and head on down to the mess hall to eat. The days you were flying, you had fresh eggs and meat. None of that powered stuff. We would finish as quickly as we could and head on over to the briefing room. It was then that we’d learn the day’s mission and what group we would be flying in, time of take off and who would be flying the lead plane. After everyone was in the plane, the co-pilot and I started our pre-flight check while the crew made sure things were all right in the back. After getting lined up, each group waited for its colored flare to be fired and after you saw it, you took off. After getting airborne, we would climb to 3,000 or 4,000 feet as we circled the base. Flying that high and providing the skies were clear, you could see the other bases in the area and their groups taking off and forming up over their bases. 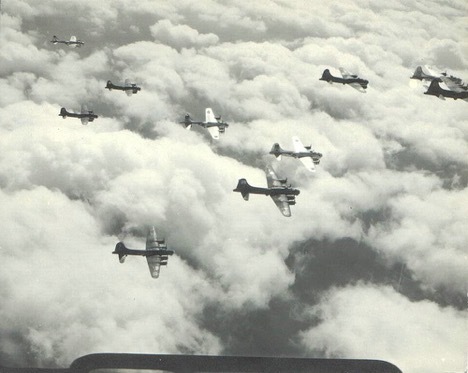 After the planes had formed up in their groups we made our way over the Channel, climbing to 20,000 feet, but even then the German 88s could cut through the bomber groups as they flew over the coast of France. Our first mission came on Friday, December 31st 1943 and the target was Cognac airfield in France. That morning started at 2:30 and we were in the briefing room by 3:00 and were told it would be a milk run, but it turned out to be anything but that. Take off was to have been at 7:30 but it wasn’t until 8:00 that we got in the air. 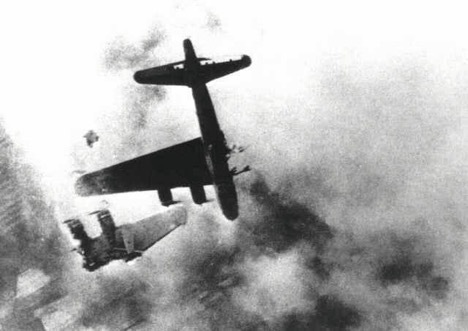 That day we were dropping our bombs in the wind and with the headwind we ran into, our air speed was cut back which made us an easy target for the German 88 flak guns on the ground. It wasn’t until we had passed through all the flak that we learned some of the planes in the second group were missing. One was Lt. Moore who, after dropping his bombs, had pulled away in flames after being hit by flak and spun down and broke up. Only five chutes were reported. After pulling away from the target, it was the fighters’ turn at us and as one came by my tail gunner, I heard him say, “that SOB just shot off my gun sight!” Most of the time, the fighters would come up from behind due to less gun fire from the B17s. As soon as we returned to base we made our way to the debriefing and were offered a drink, but West and I didn’t drink and always turned it down. After finishing up there, we would return to our room. There were always services held for the crews who didn’t return but I myself never attended them. After my first mission, I had decided I wouldn’t wear my flak jacket because it was so heavy. The day our roommates didn’t return with the group, it wasn’t until they walked into the room that we learned what had happened to them. They said they had to land at the first base they came to due to having a large hole in their wing. He went on to say the hole was large enough that you could stand in it. The following day we were non- op, so we went down to where the plane was and planned on flying it back to our base. After arriving and telling them our plan, we were told the plane was damaged too bad to fly and they were losing a crew over it. Later on, the plane was repaired and returned to our base and at one point, we had to use that plane on a mission due to ours being serviced. One day a mission came up that the target was called No Balls. Seeing the name we asked, “What is this ‘No Balls’?” and were told if we hit the target the Germans would have No Balls to fight with. On January the 30th 1944 our target that day was Brunswick, Germany and we would be carrying 27,000 gallons of fuel for our trip. On this mission, we flew with some bad information on the weather and ran into a 100 mile an hour headwind. By the time we had gotten over the target, we were down to less than 500 gallons of fuel with which to return home. Each group had to fly at a higher altitude than the group in front of them due to the contrails from the group in front of them. 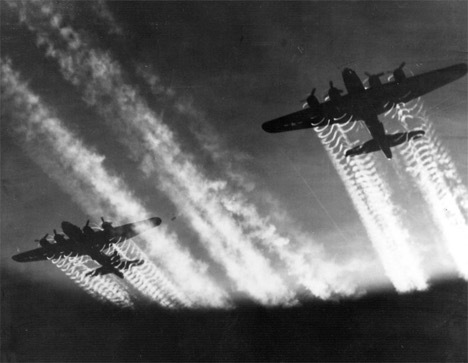 By the time it came for our group, we were at 30,000 feet which was the max a B-17 could fly and operate but our controls handled sloppily and slow. The only good thing about being that high was the German fighters couldn’t operate that high. We were just high enough that we were running in the group’s contrail in front of us and our top turret gunner had to be our eyes. His turret was just above the contrail, so to keep us from running into one of the other planes, he would report the tails of the other planes in front of us and where they were and if we needed to move to the left or right. As I said, the fighters couldn’t get to us but the flak could and as luck would have it, we were hit in our nose by shrapnel. The navigator was hit in his hand and he lost some of his fingers. The bombardier was hit by a piece the size of a softball in his chest, knocking him back into the radio room. Boy was he lucky that he was wearing his flak jacket that day. As soon as the bombing run ended, we broke up into groups of three for the return trip home. We were flying just behind our roommates, keeping an eye on them the whole time. We nursed our engines trying to conserve fuel. Luckily the 100 mile an hour headwind turned into a 100 mile an hour tailwind which helped. As we made our way home, we watched a number of planes stall out and spiral down out of sight. As we approached the coast, some of the planes who had made it down this far ran out of fuel and went down in the Channel. They kept the rescue boats busy that day picking up downed crews. The best I recall, that day we lost 25 planes. Thinking we had made it, as we came in for our landing, we found out our landing gears wouldn’t lock down in place, so we had to make a crash landing. Later on, we flew one mission in what we called having your tail out in the breeze. That means you had no protection to your right side. On days we weren’t flying, West and I would catch the train to London. Sometimes our crew would be on the train with us but after getting there they would go their own way and we would go ours. The mission on March the 16th had started on the 15th with us flying three other planes to make the mission. After picking one which was a new plane and hadn’t been painted, we reported to Colonel Harris to ask permission to fly it. We were given the okay but we had to fly in the lead spot of the second group in front. The mission on the 16th was a bombing run on an Augsburg aircraft plant in Germany. Just before we got in German airspace, I saw a group of fighters coming in from our 1 o’clock, which put the sun in our eyes. They came in on us in groups and as the last fighter came in close, I thought he was going to ram us. I could see his face as he passed by and it was this FW 190 fighter that got us. As he fired, our plane felt as if we had run into a brick wall. Our plane started to go into a spin and West and I fought to keep it out of one. The nose was blown away and wind roared through the plane. The number three inboard engine was hit and started to run away, and the wing was on fire with flames making their way down the wing. I had been hit in my left leg from shrapnel and as I looked back down the wing, the flames were in my face. The intercom had also been knocked out so we couldn’t talk to our crew but they knew it was time to bail out. I grabbed my chute and kit that had a first aid kit and silk map from under my seat. I then made my way to the escape hatch where I learned the top turret gunner had come down and helped in tossing the body of the bombardier out. It was that guy’s first mission. As we fought with the hatch I asked if he was sure about the bombardier. As we fought with the hatch the navigator was yelling, “Come on, come on!” and it was then the fear of not getting out alive set in and as it did, I ran head long into the hatch with my head and as I hit it, the door flew open and out I went. As I fell, I was on my back looking up watching for chutes and all at once I realized I had clipped my chute to my halter. Just as I clipped it and opened my chute, our plane exploded, which was still over me, sending part of it past me. Once on the ground, I hooked up with some French resistance and was able to avoid being captured for a few weeks, when a Frenchman turned me over to the Gestapo. 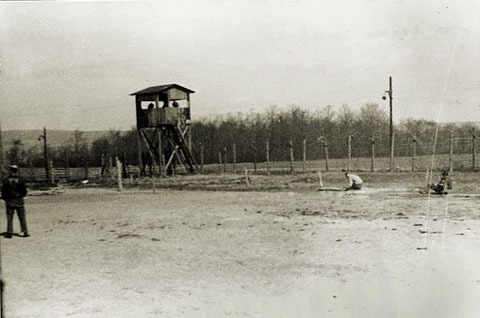 After a number of weeks of interrogations by the Gestapo, I was taken to Stalag Luft 1, where I remained until freedom came May of 1945.